Nov 24th. Caffrey, McGurk and Madge. Caffrey, McGurk and Madge. 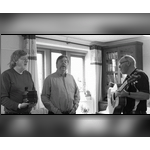 Since their first , visit Nick and Ed have been joined by Robin Madge on concertina and vocals. At their last visit they created a great rapport with the audience. With a wide range of songs and styles garnered from their time served with of many different groups you will not be short of a chorus or two.